This page explains how the device behaves in match mode as of firmware version 2018-05-05. First, to work properly, you need to have two players on court (not one, not three, not four...), one on each side of the net. 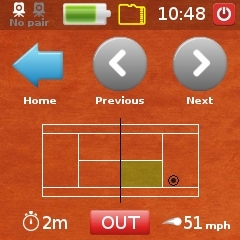 If you are alone and wants to track your serves, use the training serve modes in the Settings screen. 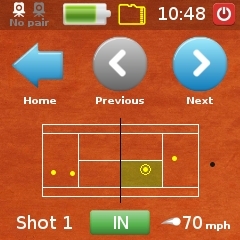 the device recognizes when a point starts and when a point ends. It also recognizes a serve shot, who is serving and where the receiver is, aka. deuce side or ad side. 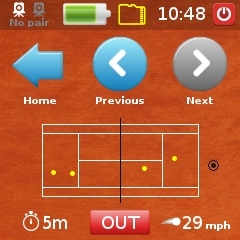 When the device recognizes a serve, the serve lines are called. If the beep is enabled, a serve IN is has a slightly longer single beep. A serve OUT is signaled with 5 beeps as usual for a shot OUT. The point rally history is available on the screen and you can go back up to the serve that was starting the point. Even if a shot in the rally is out, the device will call it out and will continue to call the lines if for any reason the point continues. When the point really ends (ball in the net, ball in the fence, whatever is happening to have the point REALLY ending), the device will wait for and signal the next serve. A future software upgrade will have match mode with score tracking. The current implementation is probably more basic but it's more flexible to adapt to a set of very different situations without any intervention from the players.